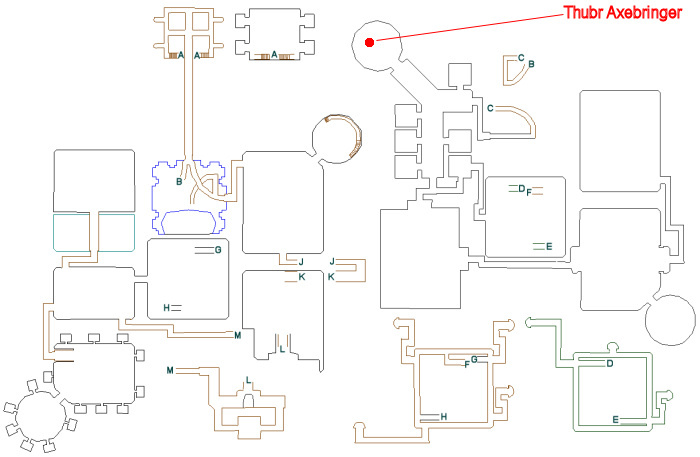 This group mission begins with Thubr Axebringer (click for map image) in the western wing of Degmar. As this takes place in an instanced zone, it is timed (six hours). Say "memorial" to request the task and "go" to zone in. You have been assigned the task 'Burden of the Past'. The time has come for Thubr to perform his ceremony. Will the dwarves of Degmar listen and understand? Hail him until the task updates. You can be sure the dwarves in attendance will love it. Thubr Axebringer raises his raw voice. 'Come! The blood runs down our hands! Lay 'em before Brell! Let our tears wash 'em clean! Now you have a dead elf on hand. Four of the dwarves in attendance attack Thubr Axebringer. Kill the four dwarves for the update. Thubr Axebringer will tank them, so you can pull them one by one if needed instead of taking all four on at once. They are of average difficulty for Degmar, are mezzable and rootable/snareable. A few of them may have a lot of hitpoints. NOTE: These mobs (and all mobs in this task) are leashed to the Sanctuary. Same as above, only five this time. Hail him until the task updates. Thubr Axebringer does not say a word. The temple is silent except for Thubr's anxious breathing. Thubr Axebringer opens his eyes. 'No one?' he says to the floor. Thubr Axebringer finally looks upon the face of the dead elf. 'Couldn't see his face; couldn't see his hands. Just a shadow of a cloud caught in the streetlamp... then a glint... a flash of lightning ta strike me down? Thubr Axebringer leans over suddenly and retches. Breathing heavily, he lies down and closes his eyes. Captain Gurshock and five guards appear (non-aggro at this time). Captain Gurshock Still alive and incitin' a riot, Priestess?! I'll do to ya what we shoulda done a long time ago, even before yer kind went crazy! You tried ta kill us! Ya even got Degmar, but ya can't get all of us! We'll get ya first! The Captain has line-of-sight aggro; the guards are of standard aggro. Guards are mezzable, but immune to root/snare. The Captain is immune to all crowd control. All of them see through all forms of invisibility and most have a lot of hitpoints. All of them 'corpse camp' (meaning they remain wherever they are pulled). Like all mobs in this task, they are leashed to the room in which they spawn (if a mob is leashed, it drops all aggro and warps back to its spawn point). NOTE: Due to the Captain's line-of-sight aggro, if you fail the fight and have to zone back in, and she's within sight of the zone-in point, you will have her immediate attention upon zoning back in. Hail him until the task completes. A chest with loot also spawns at this time. The task is repeatable with a 6-hour lockout timer from the time of request. Grats on the scholar ding here on the Zam forums! I'm having a terrible time pulling-off even the first set of angry dwarfs. It's easy to get get one solo, but my hate list is filled in the process. Right now I pull with my SK across the bridge and into the hallway between the sanctuary and the armory. On the very first pull, I get a solo pull (that part isn't hard) -- but a full hate list. How to get a single without wrecking my hate list? Getting only one physical pull but a list full of hate seems like I'll just keep drawing dwarfs with healer hate that subsequently accumulates. The angry dwarfs appear immune to any modifications in movement speed. So the snare / reset / stand trick doesn't seem to work. Is there any way to get them hung-up under the bridge? Will they just warp back? What about pet tricks? Can you send-in a pet with a healer merc and turn it into a ranged fight? What about enchanter tricks? Can an enchanter chain-cast AoE mez to deal with the dwarfs that would add as healer hate builds? How quickly do they add if you just run with a full hate list anyway? P.S. How much time are people giving Thubr to build-up hate? Obviously he needs some time. Are we talking 30 seconds, 3 minutes, or more like 6-8 minutes before peeling-off the first one? Please let us know the level of your necromancer and what mercenary (you say molo'd in the post title) as this helps others know if they can try and replicate your success. Thanks. NE corner did not work for me. Was difficult to pull just one mob off of Thubr. Placed campfire in hall between armory and jail, for safety. Did most fights in hall between armory and church. Kept group in the armory until I was sure I had singles (or had discs to handle 2 or more). Pulled with SK's agro spells. If more than one came, ran back to armory and the mobs would reset to their pews, making for simple single pulls. Not mentioned below, but the church room has a false ceiling (anybody know the term for this architectural structure?). You can get to the top of this ceiling by climbing the statue and pillar in the front of the church (may need lev). I put my wizzy dead center on top of the false ceiling and did the captain hail with him (no line of sight, so had to use /assist). Guards attacked Thubr, Captain killed wizzy on top of false ceiling and stayed there. It was easy to pull the guards one at a time without any interference from Captain. Wizzy campfired back and joined fight. Even after summoning wizzy's corpse and rezzing, Captain stayed on top of ceiling. SK had to start climbing the statue to pull captain, but he agro'd without having to cast anything. This eliminated the need to actually pull the captain anywhere and his line of sight was completely blocked. Molo'd this in 2 hours with a 105 mage, max aa and mix of CoTF-tds group-tds rare gear. Was really hard to do by myself, but doable. Found it much easier after following the advise in these posts and just eating a death below the bridge with capt. Was cake after splitting and downing the guards. So far, I have started this mission 3 times, get past the first two waves and then DDoS attacks and the server becomes unplayable. Anyway, I have been AE mezzing and then AE mem blur. First try, I took too long because of all the crap that's happening and didn't get credit for a kill, so the mission became unfinishable. So I started mem blurring every pull. Before, if I didn't wait long enough for Thubr to gain agro, even when I pull a single, if the rest of them are on my agro list, eventually they run over. Mem blur them and they stay away. Think I'm gonna farm this, at least till I make my warrior a more capable tank. It's not listed as such, but can probably drop any item from all the nameds in Degmar, as well any slot highwater armor. I got the BP and Medal of the Commander aug on the first go and a Guardian Blade (total bust) on the second. Second go took me just over 1 hour 30 minutes. I've spent more time killing PH to get a named to spawn than that and pretty sure I can get this mission down to @1 hour, probably even under once I improve DPS. Not to mention I don't think I can handle the nameds in Degmar. I beat Horthin Blackbook, but my warrior was close to dead through the whole fight. This mission would seem to be easier and a guaranteed chest within 2 hours easily. Don't bother farming this mission for armor. I did this mission 5 times now. First time, I got a highwater breastplate, a nice aug for my boxes and the earring. So I thought it'd be a nice mission to gear up on. The next 4 times, I got either the Paly/SK sword and a trash ornament OR just the paly/SK sword. Total waste of time, even though I am under an hour now. OK, took 3 hours because of waiting for lag to stop, but got it done. Followed most of what was already written. I set up on the bridge in the hallway leading to the armory. You can actually fight the mobs in the hallway. I go through the hails. First wave goes after Thubr. I AE mezz them all, pull one dwarf and mem blur the rest. The dwarfs will sometimes go back to their seats and sometimes just stand where they are at after the mezz wears off, so your next pull will be a little easier. Rinse/repeat for waves 2 and 3. For the wave with the Captain, I did as recommended and pulled her under the bridge and ate a death on my warrior and left the corpse there till done with mission. Captain stayed. Then I just AE mezz, pull single dwarf and mem blurred the rest as before. The Captain wasn't much harder than the guards. This mission was actually pretty easy. Just wanted to chime in on how we completed this today. Did the "pull under the bridge" method when neither Gurshock nor the guards were attacking. All went after our snackrifice and when he died, the guards stayed at the bottom and Gurshock reset back up top. We were able to kill the captain without any of the guards assisting, then picked the guards off one at a time. I tried that today. At like 70% all 5 guards rushed in to join the captain...duh. At the next try, I had all the guards in the other room and the captain at his spawnpoint. Didnt work either, at some point the all ran back to the captain. This certainly is the most tough (for me) mission ever. Ok, boxing a necro, mage and enchanter. The first three waves are easy enough, pulling and finish them off one by one. Problem starts with the captain. I camp in the NE corner, and after hailing the captain his guards rush off to the princess. So I just need to pull them off like before....which doesn't work. After enough dots the one guard aggro's but will run straight back after FD, pet following him. So I send in the other 2 pets as well but by the time the 2nd guard is about to die the other guards have enough healer aggro: wipe. I've found no way to kill them one by one so I gave up. I box a war, wiz, and bard.... it took me a few turns to figure this mission out but I finally got it. the first 3 waves are fairly straight forward. When it comes to the last 6 guards/captain I got everyone out of the room and parked them in the stairwell that leads to the jails. I aggroed the captain with my bard and ran him directly under the bridge then let the captain kill him. I summoned his corpse and rezzed up, keeping the group in that hallway. After the princess got enough aggro on the guards i picked them off 1 by 1 with my wiz. If you wipe and die all of the guards end up in the middle of the room, in that case I snare/faded the group into the armory room until i got them split up. It may take a few tries and patience (and a proper puller) but i can 3 box this in about an hr and a half now. Good luck! So this quest is as fast as you can kill about 20+ mobs with one complete rebuff with that strat. Cleric, necro, and chanter 3 merc tank healer caster. Set up in stair well looking out onto the bridge. But cle was set up in armory in NE corner. Can heal and buff thur wall. Had necro cast non agro snare and a dot .. it would split and we would kill it..do to all till done with all the waves. On capt stage I set up in the NE corner of the chapel. No line of sight...started to pull guards same was with out a prob, but was low on mana so I sat down. Though the guards where on the agro list they didn't atk till I sat down to med...they all atk, and killed us. (SO DONT SIT DOWN)(u can sit on mount)Thought we had to start over. But left corpses In zone and popped out, and camp fired back to quest givers room, and buffed up..but before zoning back In I casted invulnerability on the chanter and had him zone in...when the capt agroed he took him under the bridge and died. Chanter stayed in zone dead to be corpse camped by capt. Then cle and necro zone in and ran to the NW corner of the chapel. The 3 guards camping the corpses in NE corner. Necro pulled, and all 3 came ... FD'ed and healer merc..rezed are corpse..now back in NE corner we rezed the chanter corpse in the corner, leaving the one to be camped by capt....now all buffed and meded up we killed the remaining gaurds. For capt we all ran in the armory. Necro pull capt of from under bridge and into hallway to reset him on bridge ... then came back, and killed capt where he stood..he is very easy. Hope it's help for no death run. This took 4 of the 6 hours allowed, and that's a lot these days for progression missions. Learning curve involved, though, so could be repeated faster. Like maybe 3 hours 55 minutes. LOL. However I have no desire to ever do this mission again. * You got the whole empty zone so set a campfire deep inside. That eliminates most of the aggravation arising from the evac spot being too close to the mobs. * Be willing to take deaths and don't bother to rez till after, if its helpful. It IS helpful if you're going to use the campfire to come back and for placement purposes of the mobs since they corpse-camp. Among 6 toons I think we had 10 unrezzed corpses at one point. Big deal, rez them all afterwards with Expedient Recovery. * Pet-pulling is great here but it's not flawless. Not sure why. USUALLY the pet was able to single out a dorf but sometimes not. I don't know if this was a proximity problem or what. It's worth using but be careful. * OK, the final encounter. Blowing this is really going to ruin your day if you've spent 3 hours or more getting to this point. The Captain spawns away from the guards, who engage the poor high elf. What I did is pull the Captain under the bridge. I just let her kill the puller and left his corpse there so she camped the corpse. Under the bridge she has no line of sight on anything going on above. Then you can use techniques described above to split the guards. Evac actually isn't that bad for the guards since they don't have the Captain's line-of-sight agro and their agro range is small. * The Captain is NOT a tough fight at all. It's actually a relief once you get to this stage. If you successfully maneuvered the Captain under the bridge when you're ready to fight her, get a LOS angle on her from above, plunk her with an arrow and she will eventually run or warp up to the first level where she can be slayed. This one's going to hurt, based on the posts I read here and on Sony's forums. First, if Thurb kills even one of the angry dwarfs, you're screwed. No more spawn and you can't complete that step and move forward. Time to cancel the mission and start over. He's not likely to kill a dorf on his own but we had a situation where we had one dorf down to 5% and then got several adds we hadn't anticipated so we evacd. The evac worked but it re-set the dorfs onto Thurb and I guess by luck of the draw his primary target was the 5% dorf. Since we had evaced we got no credit for the 95% and even though we re-engaged quickly, when it died we got no xp message. We went on to slay the other 4 but then we got stuck at the 4/5 killed step. The dorfs on the benches will not count until they're triggered. They scowl but they can't be aggro'd and spells won't land on them until they're triggered. BTW, one thing that makes reading these posts confusing is the location where you perform this mission. It's not the regular zone-in nor is it the upper round room where Thurb lies on the floor nexr to the Princess. It's the chapel, which a lot of people are unaware of. You can reach it from the armory, two different ways, one is thru a "secret door" blocked by stacks of boxes which can be clicked open. The zone entry spot from the quest-giver is indeed sadistically placed right at the evac spot so evacing from within this instance is a big problem, especially with the boss mob who has unlimited LoS agro. Not the end of the world, though. You have an entire empty zone in which to lay down a campfire. Rather than beat your head against the wall and die repeatedly trying to zone in, summon your corpse to the GL, rez and click your Fellowship Insignia. Finished this with my druid (103) and box mage (102). First three waves tried to single kill while the wave beat on the npc, eventually the two merc healers generated too much agro. Tethering the wave worked well however, single pull from the benches was then easy. The last wave parked to the NE as suggested earlier, sent the pet in on one of the 5 dwarves attacking the npc. Easy kill, the other 4 did agro but didn't attack. Unfortunately when I cleared agro for the mercs the remaining 4 guards quit attacking the npc. Moved both of my characters to the south room (druid invuln quite handy here). At this point the captain was reset to the bridge, the 4 remaining guards just north of the captain. By using the druid to tease the captain into charging south and then fading agro I was able to eventually get two of the guards in the small passage between the rooms. Pet attacked, two dead guards. The tether allows the guards to enter that passage and come as far as the steps down into the second room. Repeating the process eventually got each of the other guards solo, one time the captain was still in the passage but it seems her tether is just a little shorter than the guards, so pet on the guard caused captain to reset. For captain alone just use eye of zomm to get a lock on the captain and sent pet around the corner. A very long, very slow process, but doable. Just completed mission with SK/Nec/Mag 105 CoTF T2- TDS T2 gear...the initial dwarves can be reset to the benches by running them into the armory once they're back in the benches they can be single pulled....the guards and the captain on the other hand are not so simple. Second I was able to single pull 2 of the guards with my SK by casting hate spells on them just enough to pull it off of the priestess. I believe this would have kept working but my mercs were continuously building hate with the remaning dwarves and eventually 3 ran at me...sk and necro died at this point and my mage made it into the armory and they reset onto the bridge. Buffed up and sent nec and mag pet on 2 seperate mobs while i pulled the 3rd guard with my SK and burned it down then went after one of the remaining then killed the final guard before encountering the captain. The captain doesnt have a very long leash and if you're fighting on the bridge like I was you'll want to make sure she's out of LoS. Very good information. The North East spot was the best but to get the guys it was terrible enough. - Mage Pet got aggro from all guards and got eaten, pulling one by one was not possible for our group after that. The whole guard crew came but luckily this time mezz sticked. AE-Mezz from enchanter with only RK.I (Deadening Wave) had so much failures that at first the mission was not possible. But with RK.II and Enchanter 200k Rune it was even possible to completely re-"pet" after 2 pets (with Suspended Minions) of Mage and Enchanter got eaten. I seriously recommend GOOD crowd control. A slight move into the wrong direction and the Captain aggros from line of sight. Fellowship was exactly in his blind spot for safety. A night before we wasted the night with 4 corpse runs and hours of tries from the small room. Set up camp in the small room. Worst mission ever! NO mission in EQ, ever, has given me as much grief as this mission. From bugs, to aggro, to mobs despawning, to the inability to zone back in once captain is engaged without insta aggro/death. Seriously, who designed this?